Fight the height - and the LED screen! URGENT! Take a look at the new Planning Committee agenda (available at the Town Hall or larger local libraries). On Tuesday (3 June) the Committee will be asked to approve the installation of a giant outdoor LED screen on the grassy area by the Town Square. This area, which on dry sunny days is very popular, is going to be wrecked. It also happens to be a designated park. I was under the hazy impression that this screen was just a temporary feature, designed to show the 2012 Olympics. Not so. What is proposed is a massive PERMANENT structure, which will be blaring out sound and vision from 7am to 11 pm, EVERY DAY. The screen will be around 23 feet wide and10 feet high, supported by two giant columns 24 feet high. The content of this unending sixteen hours a day broadcast is very vague (‘national and international events’). But guess what! ‘There may be general advertising during major events’. You bet there will. And what’s more this hideous device may well broadcast after 11 pm (‘it would not be used beyond 23.00 without special permission’ – permission which will doubtless be forthcoming). Feed will be supplied by the BBC, so expect trailers for telly programmes. Needless to say this hideous proposal is sugared with meaningless claptrap about ‘regeneration’, ‘environmental sustainability’, ‘a wider local arts and culture programme’ and ‘increased pedestrian activity’. As this crap Council is not seriously interested in any of these things, the question is: why are they doing it? Presumably because it is income generating. How much lolly will the Council rake in from programme makers and advertisers? Lots, I guess. In return local people will have their local parkland ruined by a monstrous eyesore. And every day will be like Orwell's 1984, with a giant screen booming messages for the masses. The consultation for this devastating proposal has been grossly inadequate. The screen will face north and will be broadcasting from land higher than the Square. A handful of properties on Selborne Road and the High Street (about 25 homes in all) have been notified and invited to comment. Yet this proposal will affect hundreds of homes in the surrounding area. Noise is a major issue, for a public screen broadcasting sound across the Town Square. It will directly affect residents who live on Tower Mews, Westbury Road and Cleveland Park Avenue, but not a single property on these streets has been consulted. Sound from the Town Square carries over a wide area, depending on weather and wind conditions. These broadcasts will be heard on Hatherley Road and possibly beyond. They will affect those hundreds of residents who live on high ground to the east of Hoe Street, probably as far as Howard Road and Pembroke Road. Few of these residents are going to understand what's hit them when what sounds like a noisy neighbour with a permanently-on telly hits their neighbourhood from 7am to 11pm each day. The grossly inadequare consultation - doubtless designed to muffle the possibilty of opposition before the LED screen is rushed through -has received 39 objections, including ones from Waltham Forest Civic Society and Cleveland Park Residents Association. You have until Tuesday to make your own objections known to the relevant Councillors. You can also turn up on the night. The Planning Committee meets at the Town Hall on Forest Road at 7.30pm on 3 June. The Chair of the Committee is Cllr M. Ahmad, the Vice-Chair is Cllr Bob Wheatley, the other members are Councillors M Asghar, M. Broadley, R A Carey, M T Davis, M. Martin, N. Penstone and A. Siggers. Yesterday. The car in the foreground is parked correctly, within the dashed white line markings. The car beyond it isn't, rendering the footway unusable for anyone with a mobility handicap. This is what happens when you allow pavement parking - there are always drivers who go beyond the markings. 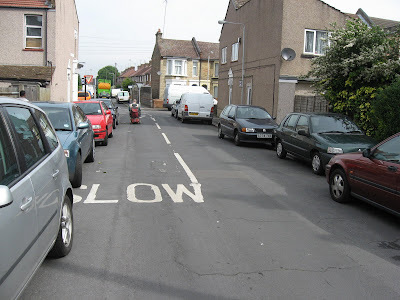 This is Spruce Hills Road E17, which isn't in a CPZ, and so it rarely gets a visit from parking attendants. 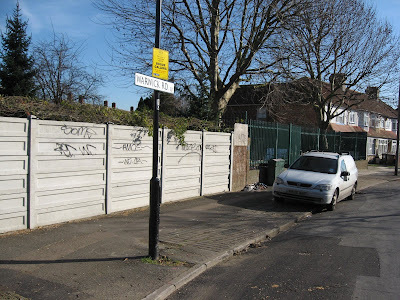 It's a relatively wide road by local standards, and is blocked off at the Forest Road end, which means that even by the standards of this crap Council the pavement parking could be removed all down one side, without affecting vehicle access. But the highway engineers are obsessed with creating yet more legalized pavement parking, not reducing what already exists. 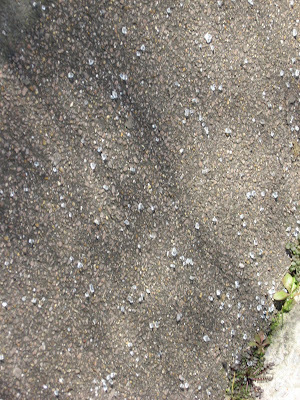 Below: this is what the pavement is like on the other side (I took this pic on a different day). 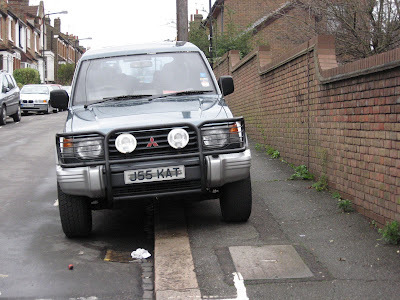 How pavements are taken over on behalf of the 4X4 brigade. While I was taking pictures yesterday I spotted a man on a mobility scooter. Because the pavements on both sides of Spruce Hills Road have been turned into car parks, he couldn't use them and was forced to use the road. 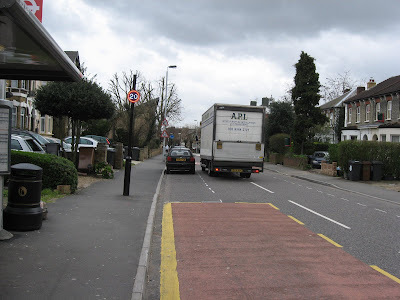 He travelled the whole length of the street in the road and in the photo below can be seen approaching the junction with Sturge Avenue. 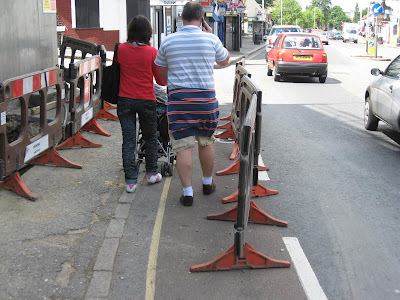 This is the reality of the policies pursued by Bob Belam - encouraging 4X4 use and forcing disabled people unto the road. Well done Bob, yet another street where the pavements have been made impassable for people with a mobility disability. 'Electrician working'. 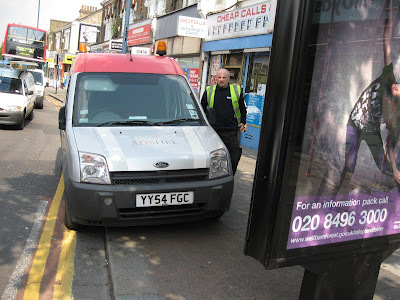 So what's so vital that an electrician has to park on the pavement and block the cycle lane at the Bakers Arms? His administrations have installed scores (hundreds?) of hideous illuminated advertising panels across the Borough. They are unsightly, are sometimes blatantly obstructive for pedestrians and are designed to attract the attention of passing drivers (so much for 'road safety'). 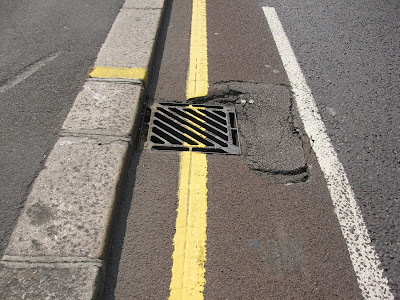 So why does this crap Council do it? Because these panels make money. 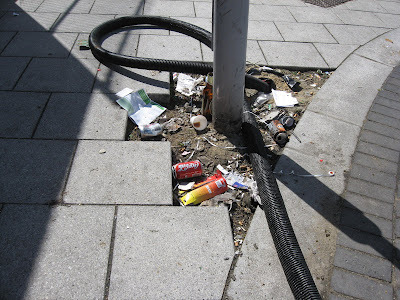 But apart from all the issues which relate to the siting of these monstrosities, there is the question of maintenance. The man in this van is doing nothing more than carry out some maintenance on one of these advertising panels. The panel is sited just before traffic turns left off Hoe Street to Lea Bridge Road. 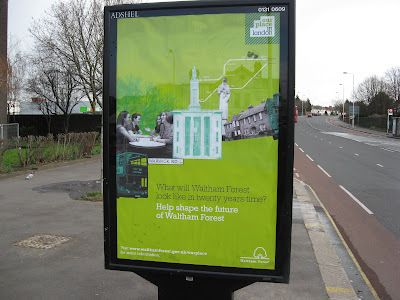 And I've noticed lately that increasing numbers of these panels - including the one shown here - carry advertising for... the London Borough of Waltham Forest. Which suggests that the Council can't even find businesses which want to use them for advertising. Somebody ought to be investigating the economics of all this. 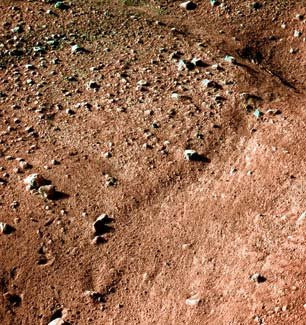 Amazing new pictures from Mars! 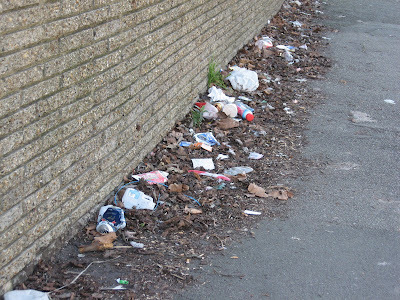 The latest photos from the surface of Mars bear an astonishing resemblance to London Borough of Waltham Forest cycle lanes and pavements - uneven, unwelcoming and covered in bits of grit and broken glass. Experts believe that in the light of these incredible parallels this conclusively proves that, as has long been believed, there is no intelligent life to be found in the Clyde Loakes administration. 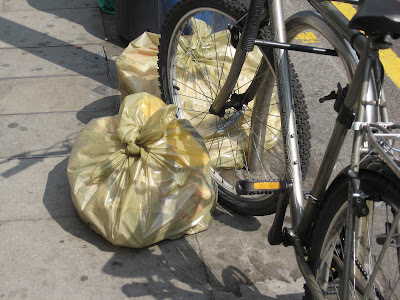 And another street sweepings sack piled against the cycle stand on Hoe Street near the junction with Hatherley Road E17. 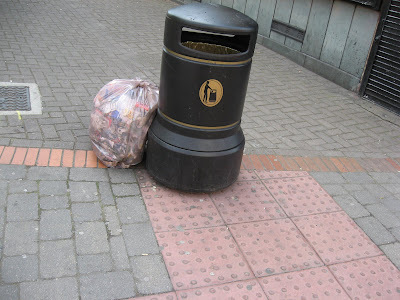 Blind pedestrians crossing Hoe Street at the lights between Station Approach and First Avenue E17 are guided by special tactile paving... to collide with a 'working towards a quality environment' council rubbish bin and a council street sweepings sack. A car dealer is giving away a gun or £125 worth of free petrol with every motor he sells. 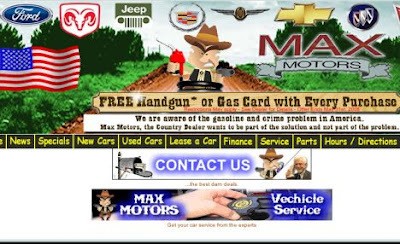 Mark Muller, boss of Max Motors in Butler, Missouri, said most customers took the gun. He added: "We're glad that we live in a free country where you can have a gun." A man and two women died when their car was involved in a crash with another vehicle and burst into flames. An early morning train from Holyhead to London on Virgin is now be three times more expensive than it was last week because passengers who were formerly able to buy saver tickets now have to purchase more expensive standard and open return tickets. Stephen Joseph, the executive director for Campaign for Better Transport, said the simpler ticket system would still not help those unable to book tickets in advance. "If you want to get a train from Manchester that arrives into London before 11am the price for that ticket has doubled in the past 10 years," he said. "What we're seeing is the disappearance of the walk-on railway and that is a real problem." We can all joke about driving at 20mph being an elusive dream in vast areas of London, where the average speed is 12mph, but relatives and friends of the 231 people who where killed or the 3,715 who were seriously injured on London's roads last year don't care about statistics on the average speed. Everyone knows that a lot of drivers go way too fast in London, and something has to be done about it. 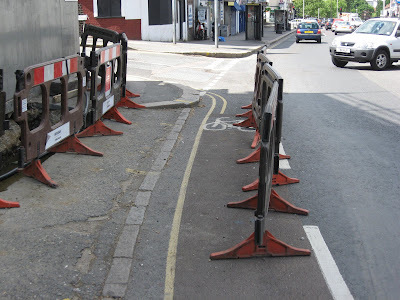 Organisations including the London Cycling Campaign believe the introduction of a 20mph zone across whole areas of London would do far more to encourage cycling than painting new cycle lanes. We have not only to reduce road danger; we must reclaim our streets by reducing the fear of road danger. Says Green London Assembly member Jenny Jones. Prince Harry could face a police quiz over claims that royal minders raced after his car at 100mph as they drove to a nightclub. Celebrity stupidity: RADIO star Chris Evans yesterday paid a world record £5.5million auction price for a 1961 Ferrari 250 GT California Spyder. 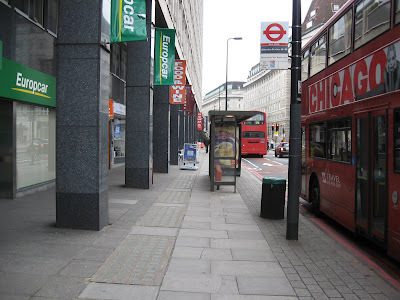 The Aldgate East gyratory was built in the Seventies but has been criticised ever since for creating a "racetrack" mentality among motorists, terrifying pedestrians and cyclists. Under an £8 million engineering scheme due to take the rest of the year, the northernmost section of the system, Whitechapel High Street, will be returned to two-way traffic. Other roads near Braham Street, including Mansell Street, Leman Street and Alie Street, will remain one-way but will get new pedestrian crossings and "advanced stop" bays for cyclists. Pedestrian underpasses will be replaced with street-level crossings. 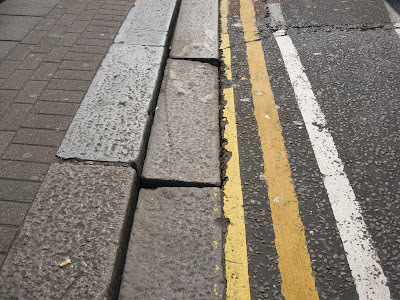 Preliminary work by engineers has started and major work will begin within weeks, with the traffic "switch" - when cars can begin to travel in both directions along Whitechapel High Street - planned for August. The project is being funded by developer Tishman Speyer, which proposes to build a commercial development at the eastern end of Braham Street once roadworks are completed. In return, the company will be given the parcel of land - which is currently highway - free. Mike Armstrong has been cycling in Cumbria and isn’t too impressed by the Sustrans C2C route: It suddenly turns into a pavement alongside the busy A66. You are facing the oncoming traffic on the wrong side of the road. Blue badge fraud is part of the £140 million of taxpayers' money that was stolen or lost from local councils in 2006-07, according to the Audit Commission. The figure, taken from the commission's National Fraud Initiative, is the highest recorded. 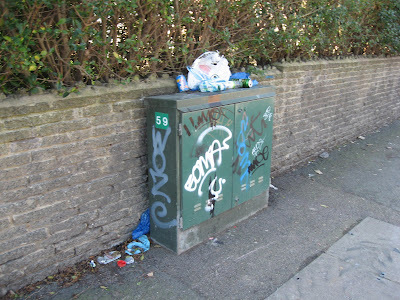 It has led to calls for councils to take a tougher line. By comparing recorded deaths with the list of blue badge holders, investigators found 16,102 people in 80 council areas were using blue badges belonging to the dead. The permits are intended for people with severe mobility problems who have difficulty using public transport. They entitle users to use free reserved parking spaces and avoid paying other fees such as the London congestion charge. The Audit Commission estimates each blue badge used fraudulently costs taxpayers as much as £5,000 a year. In most products containing nanotubes, such as car body panels, tennis rackets, yacht masts and bike frames, the fibres are embedded in composite materials, which provide strength and lightness. In this form they are likely to be relatively harmless. But the researchers said further studies were necessary to confirm that — it was not good enough to simply assume that people could not be exposed to carbon nanotubes embedded in materials. Hugh Raven, the SDC commissioner behind the report, said: "The Government thinks its evidence base is adequate. We don't think it is..This data is heavily contested. While we expected to find areas of conflict, we were unprepared for the level of fundamental disagreement over the data underpinning the Government's whole aviation strategy. The Telegraph has launched a campaign to promote a fairer deal for drivers, including pressing Gordon Brown to scrap this autumn’s planned two pence rise in fuel duty. Shockingly, Drivers are shunning large, gas-guzzling cars, according to the latest sales data released. A young man who suffered catastrophic injuries when he was hit by a car while walking along a road in Kent has been awarded £3.5m damages. Carl Wood, now 21, was struck on the northbound carriageway of the A21, near Pembury at 1am on April 4 2004. As well as skull fractures, causing severe brain damage, he broke his pelvis and right ankle, and now needs constant care. Traffic lights across London will be rephased to ease congestion on busy routes, Boris Johnson announced today. The Mayor set out plans to change the sequences so they allow more cars through on every green light. As a result, there would also be slightly longer waits at red lights but pedestrians would still have time to cross. Motorcyclists will be able to share London bus lanes under plans unveiled by Boris Johnson. 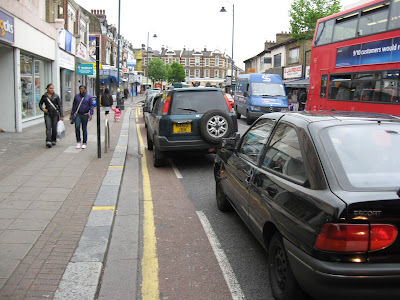 The Mayor has instructed Transport for London to develop plans to allow motorcyclists on the lanes. Mr Johnson said a similar move proved successful in Bristol and wants it copied in the capital. But cyclists claimed that allowing faster motorcycles into bus lanes would put them in danger. Tom Bogdanowicz of the London Cycling Campaign said that TfL's first report was "wrong". He told the Standard: "LCC advises against making any snap judgement on putting motorbikes in bus lanes based on what TfL has said. 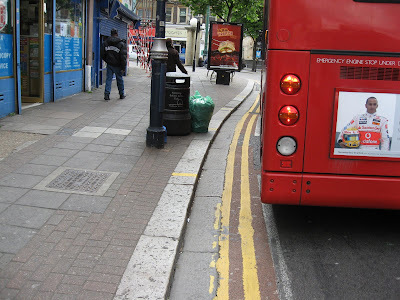 TfL says the data showed potential 'dis-benefits' to pedestrians and cyclists. Many cyclists find bus lanes a refuge from high-speed and unpredictable motor vehicles." 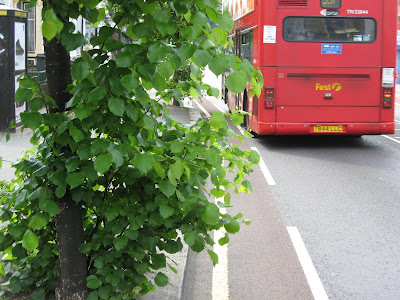 Campaigners have called for better protection for trees after claiming 9,000 were lost in London last year. A third of those trees were large, mature and in streets, according to the charity Trees for Cities. Having finally got hold of the crystal skull, Indiana Jones was faced by one final challenge: cycling with it along a one-mile section of the A112 cycle lane running between Walthamstow and Leyton. 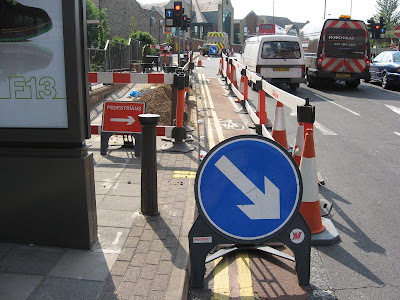 To his horror Indy saw that the cycle lane at the junction of Hoe Street and Selborne Road had been fenced off, forcing him out into three lanes of traffic. That wasn't so bad, he thought, as the leaves slapped his cheeks. There was another one coming up almost at once, just beyond the first one. But this one packed a hidden punch: it was of the thorn variety. Indy suddenly realised that The London Borough of Waltham Forest had double-crossed him. The Council talked smooth Green talk - but it was actually his enemy. And it had prepared a series of traps for him... Some of them looked harmless enough - until his wheels made contact with them. (Below) Can Indy get past these cars as they move into the cycle lane to cut him off? The cycle lane was very narrow here. The bus looked harmless enough but Indy knew that the moment he cycled alongside it, it would drift even further into the cycle lane. Or perhaps turn left. There was another red bus at the Bakers Arms junction. 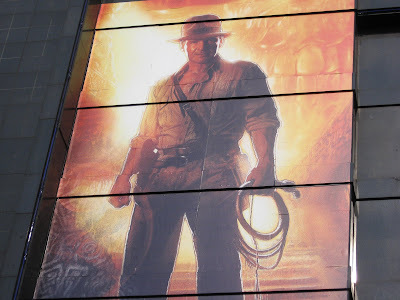 The driver lurched across the cycle lane in a sudden attempt to prevent Indiana Jones reaching the Advanced Stop Line. He made it! He was safe! 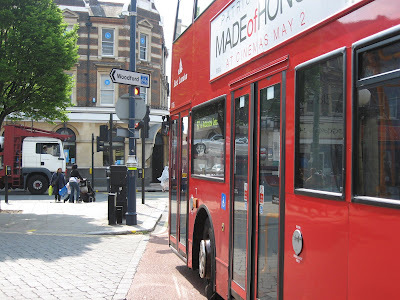 He approached the junction with Leyton Green Road. (Below) Suddenly from nowhere a car overtook, stopping in the Advanced Stop Line and signalling left. 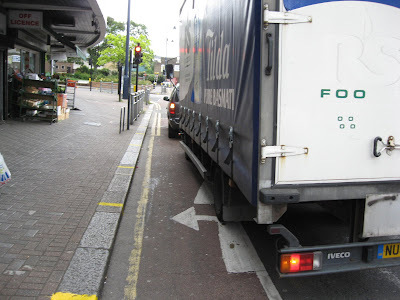 It was followed by a lorry, which swerved into the cycle lane and also signalled left. Indiana Jones let them go first. He continued a little further. And just as he thought he was safe he was distracted by the sight of a cycle logo in the cycle lane which had been obscured by tarmac. 'I must report that to the Council, he thought. 'I know they won't do anything but I'll still do it.' 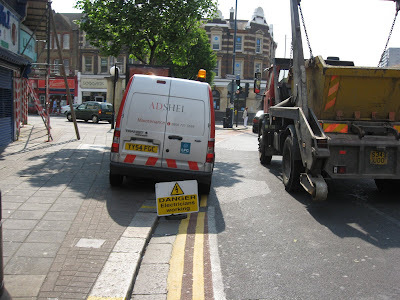 And because he was thinking about that he didn't notice the deadly 'contractor's sign trap' which had been placed in the cycle lane. And as he swerved round it he was hit by a lorry. And that was the end of Indiana Jones. Mission Grove E17. Again. Beside the bakers in the High Street. 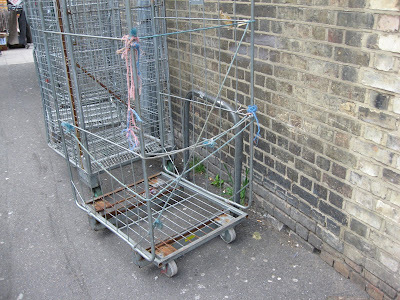 Cllr Bob Belam hands out tips on how to save the planet and the guy can't even ensure that cycle stands off the High Street are kept clear of obstructions by local businesses which are repeat offenders. Help save the planet this summer runs the headline in the latest issue of WFM. Bob’s tips include shower rather than bath and turn lights off when leaving a room. 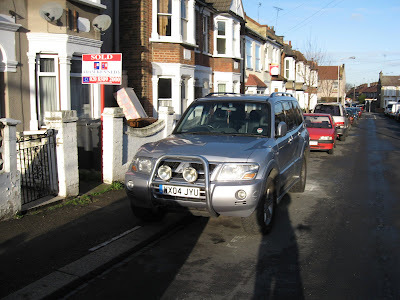 This is a bit rich from a man who recently approved the furtive extension of pavement parking on Browns Road E17. The one remaining stretch of pavement which was exclusively for pedestrians, running from Richards Place to Hoe Street, has now been converted to a car park on the narrow eastern side, where the pavement is between 1.4 metres and 1.5 metres wide. Naturally this decision was taken without any consultation or public debate. Once upon a time it would have had to be debated by the Transport Committee, but now transport decisions like this are taken behind closed doors at the Town Hall. Bob Belam, you are a hypocrite. You are no friend of pedestrians or walking or people with a mobility handicap or children walking to school. Pavements 1.5 metres wide are utterly unsuitable for parking cars on. 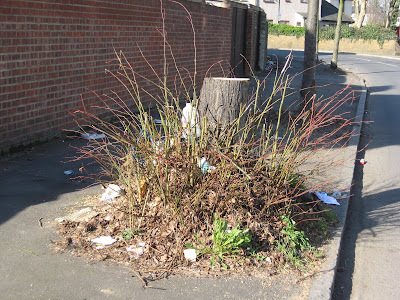 Councillors who actively degrade the walking environment are in no position to give tips on combating climate change. Browns Road once used to have car free pavements. Now the full length of the road has been converted to pavement parking. With boundless cynicism this has been done using a loophole in legislation introduced in 1985 designed to put a stop to pavement parking in Greater London. On Browns Road the space left for pedestrians falls well below national minimum acceptable widths for walkers with a mobility handicap (see photo below). Bob Belam is the enemy of pedestrians with a mobility handicap and is actively making life easier for residents who choose to buy 4X4s. 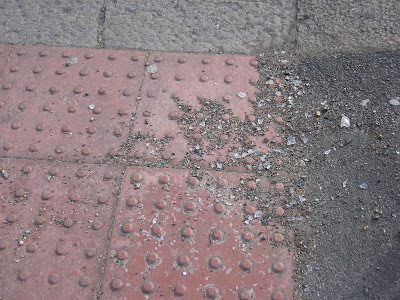 And the Browns Road pavements could easily enough be returned to the exclusive use of walkers. 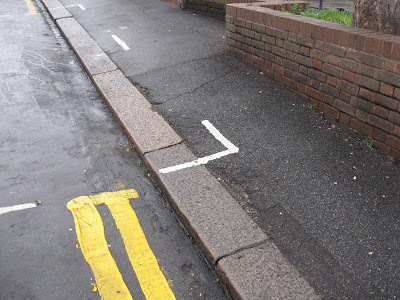 Simply stick a double-yellow line 'no waiting at any time' restriction down one side. But that would be greeted with howls from car-owning residents, some of whom would be obliged to find somewhere else to park. When it comes to a choice between pedestrians and residents who buy cars, second and third cars, and bigger and wider cars, Bob will always choose the easy option - like every other politician on the planet. And if the Council is seriously concerned about saving the planet it could spare the life of hundreds of trees by terminating publication of its crappy propaganda rag WFM, which is lavishly subsidised out of council tax. No one would miss it. 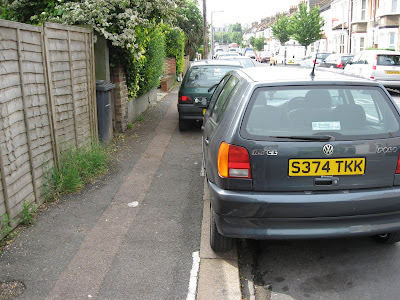 Putting cars before the requirements of wheelchair users on Browns Road. Forest Road E17, junction with Howard Road. Courtenay Mews E17. The recently revamped pedestrianised area by the bus terminal and St James Street station. I've blogged about this before. The contractors who paved the site didn't bother to finish the paving, and also left this long, mysterious length of flexible tubing which emerges from the ground and extends across the footway. It's a hazard for anyone who has a visual impairment, apart from being unsightly. Naturally nothing at all has been done to rectify the situation. The only difference since I last passed this way is that the unfinished section is full of discarded cans and other rubbish. Red-light jumping is at "epidemic proportions" in London, a survey reveals. Pedestrians are being put in danger by road-users who race through traffic lights each time they go red. The survey for the Evening Standard found one in every 25 - including motorists, cyclists and bus drivers - routinely "runs" traffic lights. At Trafalgar Square, researchers spotted 117 road-users charging through lights after they turned red over a three-hour period. Fifty one were cyclists, 13 were motorcyclists and 23 were car drivers. Eighteen vans shot through on red, as well as four police vehicles not on emergency calls, three lorries and five buses. 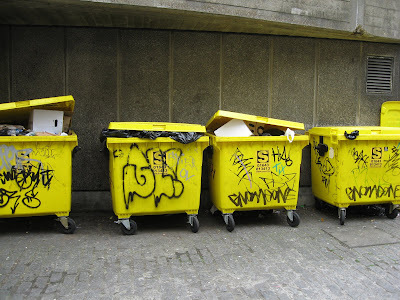 The survey was repeated at other locations in central and outer London with similar results. This survey did not include the new Mayor,who was filmed cycling through six red lights, failing to stop at a zebra crossing and mounting the pavement. We are suffering what she calls a noise epidemic. The resulting physical fights kill five of us a year, and the stress, according to the World Health Organisation, another 3,000. Noise aggravates many of modern Britain's characteristics: alcoholism and addiction; aggression and violence; and a general desire to flee the country. Paul McCartney’s new ‘green’ car was delivered… by plane, from Japan to Britain. Paul was offered a Lexus as a gift and ordered the hybrid limo because it helps to reduce emissions. Carbon offsetting firm CO2balance.com said the plane journey would have caused a carbon footprint of 38,050kg, compared to 397kg for a three-week boat journey. Co2balance.com Director Mike Rigby said: "That is the equivalent of driving the car around the world six times." Paddy Gillett of the anti-aviation lobby group Plane Stupid, said: "For anyone to pretend that a private limousine is in any way eco-friendly is like pretending a private jet is. It's total greenwash." Sir Paul, who is also a vegan, has previously lauded Lexus for their commitment to making hybrid vehicles. Lexus sponsored the singer’s 2005 US tour. Members of the European Parliament are routinely accepting gifts, wages and hospitality from companies they are charged with regulating. Among senior British MEPs who admit taking gifts, money and hospitality from businesses is the West Midlands Conservative MEP, Malcolm Harbour. He is a leading figure in the debate on carbon dioxide and fuel efficiency in Brussels. Since 2004, Mr Harbour has been loaned 18 cars by the industry. Also courtesy of the car industry, he has attended Grand Prix races and received cross-country driving instruction. Provided they declare any interest, MEPs are not breaking any regulations. Mr Harbour says he drives cars because he needs "to understand what is going on, and I declare it as I feel that I have nothing to hide". Another self-declared beneficiary of the car industry's generosity is Martin Callanan, a Conservative MEP for the North-East. In 2006, he was given a discount by Ford when buying a new car. Along with a colleague, he recently tabled a crucial amendment to a report on CO2 emissions for cars. It gave manufacturers three extra years to prepare for the limit, a move described as "disastrous" by Green MEPs. Scientists say the shift could indicate that the Earth is losing its natural ability to soak up billions of tons of carbon each year. Martin Parry, co-chair of the Intergovernmental Panel on Climate Change's working group on impacts, said: "Despite all the talk, the situation is getting worse. Levels of greenhouse gases continue to rise in the atmosphere and the rate of that rise is accelerating. We are already seeing the impacts of climate change and the scale of those impacts will also accelerate, until we decide to do something about it." Former footballer and TV pundit Steve Claridge has been found guilty of dangerous driving. Following the verdict the court heard that Claridge already has nine points on his driving licence. He was fined and given three points on November 1, 2005 for ''failing to give information as to the identity of the driver''. He was also fined and given three points in August of the same year for a similar offence. On December 29, 2005 he was issued with a fixed penalty notice for exceeding the speed limit on a motorway and given a further three penalty points, the court heard. Adjourning sentencing until next month, Judge Peter Carr said he considered the dangerous driving conviction ''a serious matter'' and imposed an interim disqualification, banning Claridge from driving immediately. fat people are now being blamed for global warming. British scientists say they use up more fuel to transport them around and the amount of food they eat requires more energy to produce than that consumed by those on smaller diets. According to a team at the London School of Hygiene & Tropical Medicine this adds to food shortages and higher energy prices. Researchers Phil Edwards said: “We are all becoming heavier and it is a global responsibility. Obesity is a key part of the big picture." Blogger Guido Fawkes was sentenced to a three month curfew order this afternoon after being convicted of driving while over the legal alcohol limit and without insurance. Appearing at Tower Bridge Magistrates Court the blogger, real name Paul Staines, was told the curfew would operate between the hours of 9pm and 6am. Staines, 41, will also have to wear an electronic tag. The judge also handed down an 18-month supervision order and a three year driving ban. Staines will be required to retake his driving test when the driving ban has elapsed. He was also ordered to pay the prosecution’s £60 costs. They advised me, while one of them looked through all the pictures on my digital camera, that this is the sort of thing that is liable to get one arrested under anti-terrorism legislation, what with it sort of being near a major transport hub. They further advised me that following arrest, one would usually end up being strip-searched and possibly questioned for quite a long time under what might prove to be testing circumstances. The 60-year-old Mid-Sussex MP, who already had nine points on his licence, was banned from driving for two months after admitting driving without insurance. He was also fined £215 and told to pay £35 costs by magistrates in Crawley, West Sussex. Soames, an Old Etonian friend of Tory leader David Cameron, was summoned to appear in court after the footage showed him riding the quad bike at Slaugham, near his home in West Sussex. It may not look like it but this was once a thriving newsagents. But all that changed in just a few seconds when a driver lost control of her car and ploughed through the front door. "Although there is a lack of physical evidence to ascertain the exact speed, my colleagues and myself believe from the evidence that exists that Mr Singh's car was travelling at around 70mph." After the inquest at Westminster coroner's court, Mr Jones said outside: "I have to live with these injuries for the rest of my life. "My life has been shortened and I will never do things that I loved like ski ever again. And this is all because someone decides to drink before getting in their car." A lying policeman who invented a bogus car chase to avoid paying a speeding fine has been spared jail. Fairlop Road E11. The 20 mph sign lights up, triggered by a driver flouting the speed limit. Research from the Department for Transport indicates that 1 in 40 pedestrians struck by a car at 20mph dies, compared with 1 in 5 at 30mph. At 40mph the survival rate falls to 10 per cent. A 1mph cut in average vehicle speed reduces crash frequency by about 5 per cent. The speed limit on thousands of residential roads will be reduced to 20mph under government moves designed to cut road deaths by a third over the next decade. Variable limits will be introduced on main roads near schools, with digital signs ordering drivers to cut their speed to 20mph or less when pupils are arriving or departing. Cameras that detect a vehicle’s average speed will be used instead of road humps to enforce the limit in some of the new 20mph zones. Only ‘some’ of the zones will be backed up by speed cameras. What proportion is ‘some’? 20 mph zones work with solid speed humps. They don’t work with speed cushions. And they don’t work at all on roads without physical speed restraints or speed cameras, because a very large percentage of motorists are simply not prepared to obey the law and are utterly indifferent to the safety of pedestrians and cyclists. 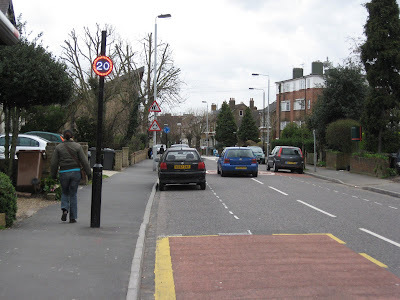 Fairlop Road E11 is a 20 mph zone. The sign flashes thousands of times a day as drivers speed down the road, wilfully ignoring the speed restriction. 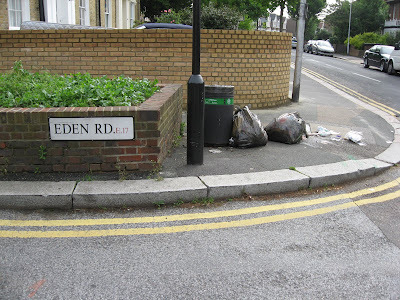 It’s just the same on Hale End Road E17 and on other roads of this type in the Borough. Perhaps this cynical indifference to speed limits is hardly surprising when a driver guilty of causing death by dangerous driving as a result of driving at 46 mph in a 30 mph zone, killing an elderly man who was crossing the road, was given a ten-month jail term suspended for two years after the judge heard his reasons for speeding. Griffin of Astley Bridge, Lancashire was also banned from driving for three years and also ordered to pay £750 costs. By 2006, serious injuries were down by 35 per cent but deaths had fallen by only 11 per cent. Hospital admission figures show that serious injuries from road crashes have hardly changed since 1996. This may indicate that the fall in numbers of traffic police since 1990 is resulting in fewer serious injuries being recorded. 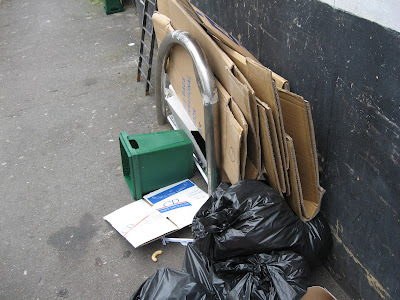 If you bother reading the Council's lavishly subsidised propaganda rag WFM or glance at those obstructive panels which the Council is fond of installing on pavements (because walking doesn't make money but advertising panels do), you may have spotted the vomit-green collage shown above. 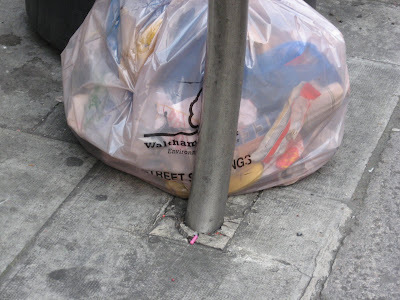 What will Waltham Forest be like in 20 years time? it asks. My guess is (i) even crappier than it is now (ii) suffering from extreme weather patterns as a consequence of climate catastrophe - a catastrophe which in its own small way the Council is doing its bit to bring about (iii) full of grotty new high-rise developments (iv) containing within its borders four malodorous toxic-particle-spewing incinerators instead of one. Sorry, did I say incinerator? I believe the acceptable political term is eco park. For some unexplained reason the collage features the street sign for WARWICK ROAD E17. And, yes, I've been there and it's crap. But there's certainly room to make things even worse. For example, the Council has turned the pavement into a car park but sadly not enough people have yet invested in that second or third vehicle to fill up those empty spaces. In 20 years Warwick Road will undoubtedly be solid with cars. The Council has been cutting down those nasty trees! The goal is to annihilate them all. (Below) The symbol of the Borough. A graffiti spattered cable TV box, crowned with miscellaneous crap. This speed limit sign on Hale End Road E17 has been obscured, presumably by someone who objects to a 30 mph limit. The sign, near the junction with Studley Avenue E4, is close to the site of a pedestrian fatality. A child was run down and killed here while crossing the road, some years ago. After his death some traffic islands were installed, together with cross-hatching and other markings in the carriageway. But back then a single death didn't qualify for a speed camera. Today, drivers still race down the hill here at excessive speed. A new 20 mph zone has been introduced further on, at the bend by Oak Hill. There's an illuminated speed sign which flashes all day long as drivers ignore this new speed restriction. The Council would like to reduce single occupancy car use, and dependence on the car as the sole means of transport. As part of this brave new world it is, er, proposing to shut down a public footpath. 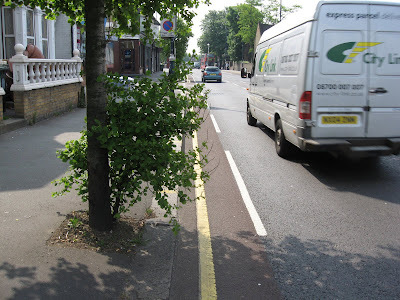 The deadline for objections is next Monday, so if you live in the Borough and haven’t yet registered an objection to The Waltham Forest (Public Path) (Stopping Up) (No. 1) Order 2008, please do it soon. Send your objection, quoting reference PCL/TMO/AC/LB30/WC, to the Council's agents: The Project Centre, 14b St Cross Street, London EC1N 8XA. Their email address is here. Say that public footpaths should be preserved, not closed, and that this path provides a direct and attractive route for local residents who prefer not to use a car. (ii) Unwithdrawn objections are forwarded to the Planning Inspectorate. The choices after that are either (a) a public inquiry, or (b) a visit to the site by a planning inspector who decides whether or not the objections have merit and arrives at a legally binding decision. In this instance (b) is a quick, simple and perfectably acceptable option. (iii) Finally, when offered options (a) or (b) say that you are happy for a planning inspector to make a site visit and reach a decision on the matter. The HGV lobby is always very good at getting prominent stories in the media about how rising fuel prices victimise the poor old lorry industry. 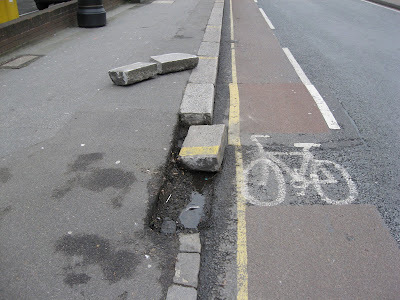 But you never see stories about the phenomenal damage done to local environments by crap HGV drivers, who regularly hit street furniture, bash bollards and drive over pavements smashing utility covers. They leave local authorities to pick up the bill, which means in reality that the HGV industry enjoys a hidden subsidy from all Council tax payers. 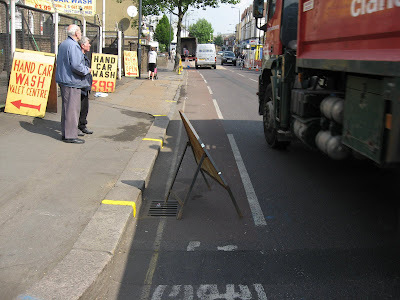 The damage above, on Forest Road E17, is almost certainly the work of a Heavy Goods Vehicle. But it's the residents of Waltham Forest who'll be paying for the damage to be made good. In fact according to one estimate, the lorry industry enjoys a hidden annual subsidy of £6.7 billion and Heavy Goods Vehicles (HGVs) on Britain’s roads are not paying anywhere near the full cost of the damage they cause to roads and communities, leaving taxpayers to pick up the bill. 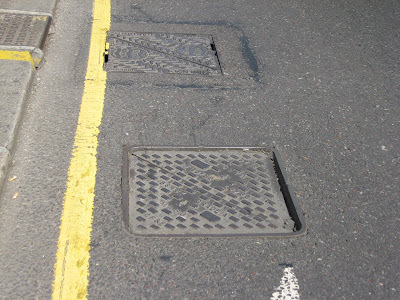 Meanwhile the utility cover smashed by a Heavy Goods Vehicle driving over the pavement has still not been fixed on Tower Hamlets Road E17. I first noticed this last December. 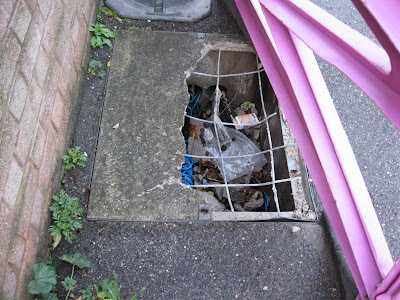 Although aware of the situation, this crap Council hasn't lifted a finger to see that the cover is replaced and the pavement made accessible for wheelchair users etc, who currently can't get past the temporary fencing. 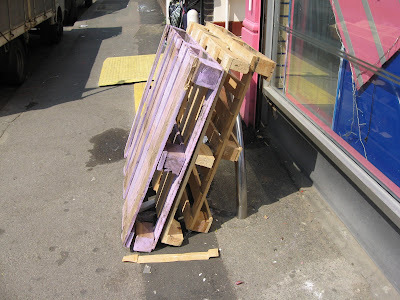 There are no less than three of these heavy wooden pallets stored by a market trader against this cycle stand on the corner of Erskine Road and Walthamstow High Street (Friday mid-day). No wonder some of the stands in central Walthamstow are coming loose from their foundations. 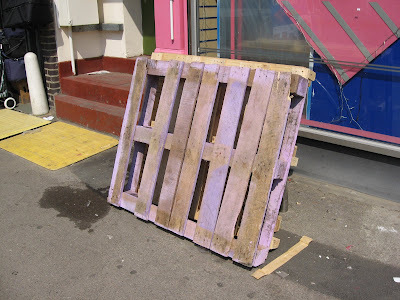 Below: more pallets. 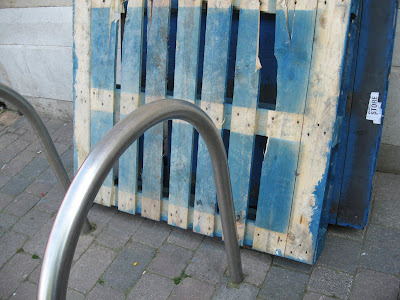 Market traders are still using the cycle stands by the library in the Town Square as a storage facility. Yesterday. A cyclist was killed when he was crushed under the wheels of a lorry, after apparently jumping a red light. The 30-year old died in the collision in Hackney yesterday morning. Witnesses said the cyclist had jumped a red light as he headed south in Kingsland Road and tried to ride around the lorry, which was pulling into the road from Middleton Road. All I could find out about the episode I linked to here. Now it seems the truth was more complicated and the cyclist was in no way to blame. The family of a cyclist killed in a collision with a truck has called for heavy goods vehicles to be banned from London during the rush hour. Antony Smith, 37, was cycling to work when he was crushed by the tipper truck as it turned left into Kingsland Road, Hackney. Paramedics were sent to the scene, but Smith suffered head injuries and was dead by the time they arrived. Smith, a graphic designer, was the fourth cyclist in the area to die after being hit by a lorry in the past two years. In a tragic irony, the truck and cyclist had been waved on by police officers carrying out a road-safety campaign moments before the collision. The circumstances of the collision still strike me as being a little hazy – does ‘The truck was in the cycle lane’ mean that the truck was in the Advanced Stop Line? By the sound of it the cyclist was wholly innocent and a police officer negligently beckoned forwards a cyclist and a left-turning lorry at the same time. And what on earth is that 'road-safety campaign' supposed to signify? I reckon there are still a lot of searching questions to be asked about this fatal incident. Let's hope the inquest will clarify matters. Where did the Evening Standard get its information from? Was this an honest mistake by a Standard journalist or a calculated act of disinformation by the Met’s press office which was keen to shift the focus away from possible gross negligence by a police officer? Sadly, the only new material I can now find on-line about this story is this. Parents' fears about road safety are turning children into a lost generation of cyclists, says a government-backed agency that promotes cycling. Four out of five children are banned from cycling to school by their parents, a poll of 1,079 parents for Cycling England suggests. New figures show that the number of cars owned by British households has increased by five million to 27.8 million in the past decade. In the past two years alone, there has been a 3 per cent increase in distance travelled by car to 5,900 miles per person per year. More than 260 motorists a day were caught speeding in a week-long campaign co-ordinated by Suffolk Police. An average of 264 motorists were caught speeding each day - a 94% rise on last year when 954 were caught. Sgt Steve Knight said a "significant" number of motorists have "failed to grasp the concept" that speed kills. "Motorists really have no excuse," he said. 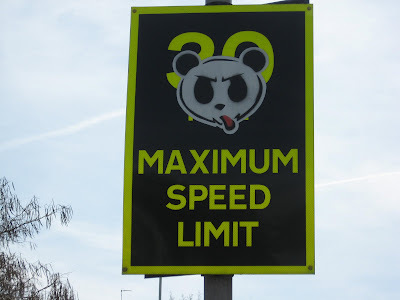 "The campaign was well-publicised and there still seems to be a significant number of drivers who have failed to grasp the concept that speed kills. Four years ago officers in Derbyshire agreed to take down a fixed speed camera found to be hidden just two yards behind a 30mph sign on a bend on the A6 near the village of Ambergate. Police, who claimed it had never been turned on, removed it after accepting it was "inappropriate" and didn't give motorists "a fighting chance". "Then he just came over and said, 'I'm terribly sorry about this sir, I'll let you off this time if you don't mind.'" Glenister, who recounted the latest episode in Gene Hunt's colourful career to Christian O'Connell on the Virgin Radio Breakfast Show, ended up saving his driver three points on his licence as well as a £60 fine. The death of a pedestrian run down and killed by a police van is not going to be investigated by the Independent Police Complaints Commission (IPCC). It will be investigated internally by West Mercia Police. England cricketer Andrew Flintoff avoided a speeding conviction today after his lawyer pointed out the police had posted his prosecution notice two days too late. Flintoff was represented by Nick Freeman, the solicitor known as Mr Loophole, who has successfully defended many high-profile people who had been charged with motoring offences including Sir Alex Ferguson, David Beckham, Ronnie O'Sullivan and the model Caprice. Flintoff, 30, of Altrincham, Cheshire, appeared this afternoon before Liverpool magistrates. He was recorded by a speed camera on the M62 on July 1 last year, and was alleged to have been driving at 87mph in a temporary 50mph zone. The bicycle. It's the model of green transport and sales of folding ones that fit on trains are stepping up a gear. But as they multiply, so does rush-hour resentment, as commuters and cyclists come to blows. Peter Hendy was lobbying hard to keep his £320,000-a-year job. Since the election, "Hendy has been bending over backwards to help us", said one Johnson aide. "He has studied our pledges and came in to his meeting with a document on how they could be achieved." Hendy is expected to be kept for the next few months, partly because some of his potential replacements are asking to be paid too much. 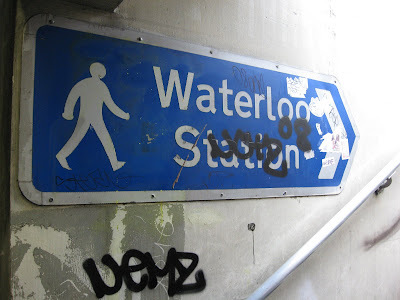 A design disaster: the main entrance to Waterloo Station. The attractive baroque arch has had a monstrously banal office block built right alongside, and the foreground is cluttered with an incoherent forest of signs, railings and sundry objects. William Morris gave his last public speech here - he would weep to see how backward and banal London still is. And note that even here the small minority of drivers is given precedence over the vastly greater numbers of pedestrians. Walkers are forced out across a carriageway into a central strip. If you are turning left into York Road you then have to cross back again, because railings prevent you taking the simplest and quickest route. No wonder the man in the photo below is choosing to walk in the road rather than take the longer route. 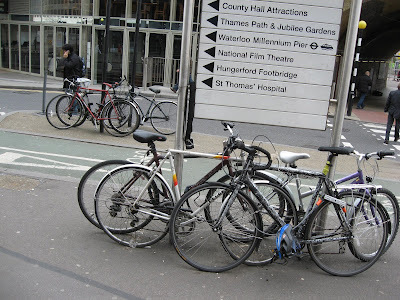 And note the scores of bikes locked to those railings. 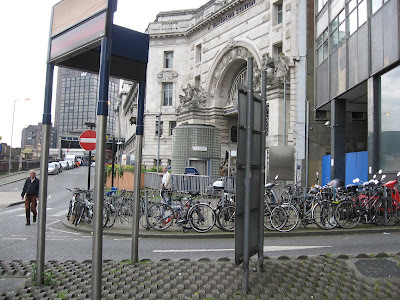 No cycle stands. 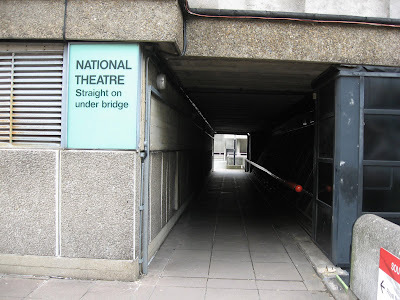 If you are heading across the road to the South Bank the green phase for pedestrians lasts about three seconds (and Mayor Johnson plans to increase the red phase for pedestrians in London, so that drivers have to wait less). I don't walk slowly but even I wasn't even half way across the road before the green phase ended.